Liverpool are well and truly in the race for the title following three months without a loss. Arsenal is setting the pace for the league and have only lost once; they will be tough to catch but another good month in December could put us into contention. December is a tough month for us regardless of the fixture congestion. We play both Manchester clubs and face some tricky away trips which could be banana skins for us. I have mentioned previously that our squad is lacking in depth meaning I have relied heavily on youngsters on the bench. The addition of Martin Caceres has provided options at the back, but I am hoping the board will fund some transfers in January. On with the episode. My 4-3-3 tactic is still going strong. Sadio Mane and James Milner could miss crucial fixtures due to injuries but fingers crossed they can recover in time. Roberto Firmino is being used as an inside forward, and I have Georginio Wijnaldum back following his back injury. Adam Lallana should be back sometime this month which is another boost. Our first game of the episode is against David Moyes’ Sunderland. The Black Cats have been playing above expectations in the league this season and are currently sat in mid-table. We didn’t play well against Watford which worries me going into this game. We need a big performance to stay in the race for the title. I had a feeling that we would struggle today and I was proved right. 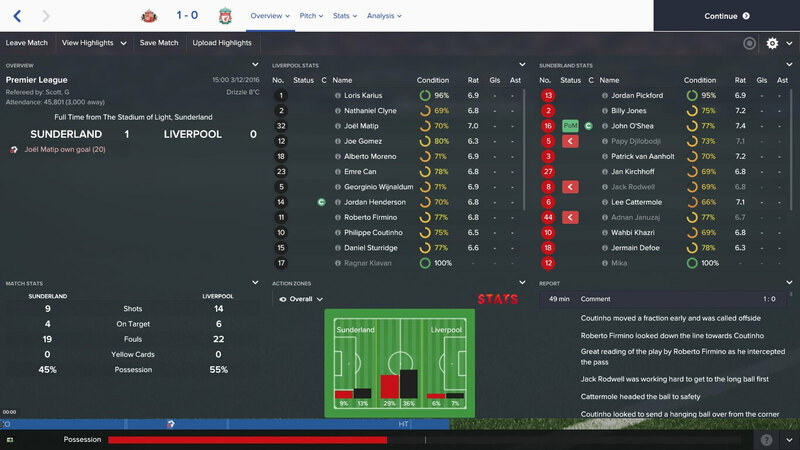 We didn’t play too poorly but fell behind due to a Joel Matip own goal. This enabled Sunderland to park the bus efficiently, and we couldn’t break down a stubborn defence. Firmino out wide is an issue, but we don’t have anyone else capable of playing there. Another game with loads of shots, but no goals. An unfortunate result. Next up, Crystal Palace at home. Alan Pardew’s men are struggling and represent the perfect opportunity to bounce back following our embarrassing defeat to Sunderland. The pre-match press conference emphasised the importance of a result for Pardew and a loss could see him lose his job. As I’m not Pardew’s biggest fan, I was happy to add fuel to the fire and put a bit more pressure on his shoulders. Mane returns for Firmino. 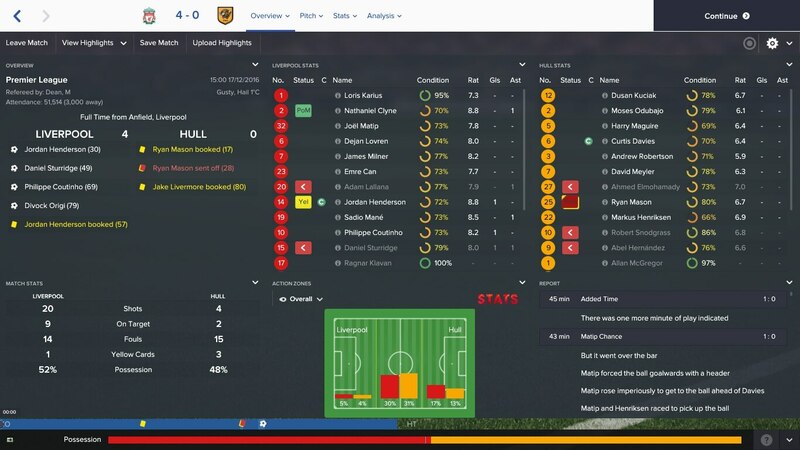 Sunderland received a slice of fortune in our last match, and now it’s our turn. Joel Ward’s own goal in the 12th minute was enough to secure all three points. Again, we struggled to convert chances into goals, and that will cost us again better teams. I might look to bring in some attacking and technical coaches in the hope of more goals. Philippe Coutinho is a crucial player but needs to step up his game. Our last three games haven’t been the best and now is the time to step up. We travel to Old Trafford desperate to get a result over our North West rivals in what is our biggest game of the season. A result here would put distance between us and the Red Devils, who are four points behind us in the table. Jose Mourinho attempted his mind games in the pre-match presser, and questioned my team’s ability to win the game. Lallana returns and Dejan Lovren replaces Joe Gomez who is suspended. What a performance by the lads! There is no better feeling than winning at Old Trafford! Mane was exceptional and the man of the match. He opened the scoring in the second half with an incredible solo effort and also teed up Coutinho for what proved to be the winner following a late strike by Anthony Martial. Having Lallana back in the side is a huge advantage as we create more chances with him back in the side. Lovren was also a top performer, keeping Zlatan Ibrahimovic quiet. A massive three points. What a result against United! We welcome Hull to Anfield next, full of confidence after our victory on the road. Mike Phelan’s side are just above the relegation zone, and it should be a comfortable win. Lovren keeps his place in the side after an impressive performance and Milner replaces Alberto Moreno who is suspended. It’s two wins in a row after we cruised to victory over the Tigers. Mane and Lovren were superb yet again while Nathaniel Clyne was the man of the match at right-back. Milner also performed well at left-back, and we exposed Hull’s weaknesses in the defence perfectly. Sturridge was back on the scoresheet, and Divock Origi netted his first of the season off the bench. A routine win which could have cost Phelan his job. Our last fixture before Christmas and it’s a tough one. West Ham are flying in the league and currently sit in seventh. The Olympic Stadium has been fruitful for Simone Zaza, who has scored 13 goals at home this season. A win would be crucial before a top of the table clash with Manchester City just around the corner. No injuries would also be a plus. Zaza was highlighted as a dangerman in the pre-match analysis and the on-loan forward proved to be a thorn in my side, but individual mistakes cost us on the day. Two errors from Loris Karius gave Zaza the easiest of finishes and he had a brace before half-time. Sturridge scored from distance in the second half, but we couldn’t find an equaliser. A hugely disappointing result and one that has made me question Karius’ ability in between the sticks after some poor performances. Our Boxing Day fixture matches us up against Burnley, who are well clear of the relegation zone after a solid start to the season under Sean Dyche. I have decided to change the starting eleven with eyes on our crucial fixture against Manchester City. Simon Mignolet replaces Karius in goal; Gomez comes in for Lovren and Firmino replaces Sturridge up top. Moreno comes back into the side for Milner, who struggled in the complete wing back role. That’s more like it. Mane was the top performer again. He opened the scoring after just six minutes and was a constant threat down the right. Jordan Henderson ran the game and deserved his goal on 22 minutes, an excellent curling effort which gave Tom Heaton no chance. Mane made it three with 20 minutes to go, but Scott Arfield denied Mignolet a clean sheet on his return. The Belgian made some cracking saves and has done enough to retain his place in my starting line-up. We welcome Manchester City to Anfield for our final game of the year. City are hot on our heels in fourth, and a result here would be massive. Pep Guardiola had some nice words to say about me in the press conference, but I made sure I focused on Liverpool and getting a result. Unfortunately, Raheem Sterling is injured so will miss out on his warm reception by the Kop. Both Henderson and Lallana miss out through injury, and Sturridge starts against his former club. What a win! This result could prove crucial in the long run and puts us right back in the race for the title with Arsenal dropping points against Tottenham. Sturridge was the hero with two outstanding goals against his old employers. He left Claudio Bravo with no chance with a low strike from outside the box before keeping his cool to chip the Chilean keeper to seal the game. Losses against West Ham and Sunderland are disappointing but wins against the two Manchester clubs is massive. 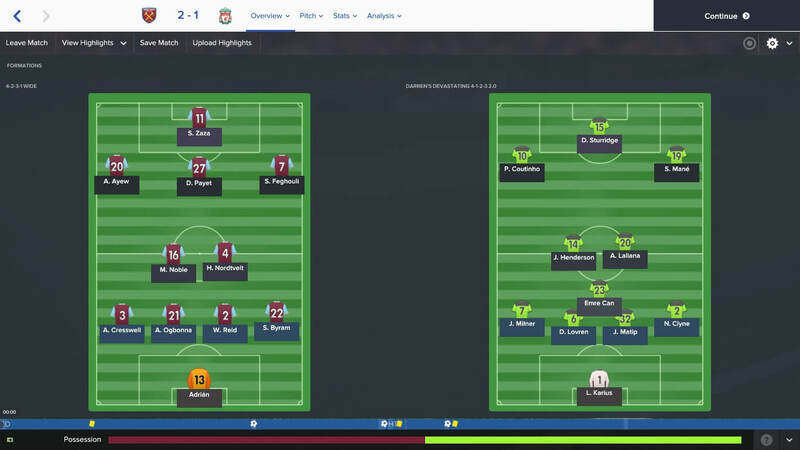 The January transfer window is upon us, and I am hoping the board will provide some funds to improve our squad depth. I can’t picture any players leaving unless the right offer arrives. It’s been a blockbuster of an episode due to the amount of games, but we have got through relatively unscathed. Enter your email address to follow The Beautiful Game and receive notifications of new posts by email.